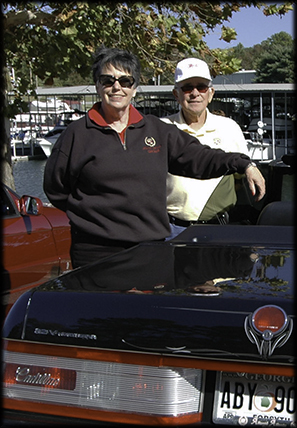 Well here we are again…heading into the Fall Cruise Season. September is our Tech Session event being held at Norman and Linda Penfield’s business warehouse in Holly Springs. Last year’s event was great with Bill Corn sharing his skills and expertise on his Allante’. Others attending offered their input on some of the challenges with owning an Allante’. We’re hoping we will have a good turnout again this year. This year our Fall Cruise will be heading to the Allante’ / XLR Grand National Meet being held in Nashville, Tennessee October 14 through 17. John Monzo, Sal Caravello and others have been working diligently to organize an event that we will long remember for our Allante’s and XLR’s. Those of us attending: Norman and Linda Penfield, Russell and Paula Vopelak, Bill and Kathy Winkler, Sal and Colene Caravello, Steve Garrity, John and Beth Nash and Bill and Mark Corn will enjoy Tennessee hospitality and fun. We’ll be sure to tell everyone about the fun, and the fellowship with other Allante’ and XLR owners. Pictures will be shared and stories will be told. November is our traditional month of Thanksgiving where we gather for a bountiful breakfast to share our blessings and wishes for the forthcoming holidays. December is our Christmas event which will be local so that more of our members can attend and enjoy the start of the Christmas Season as a Club. Keep posted for the Evite sharing the date, where and what we will celebrate. And for those newer members please be sure we have your correct and complete information: mailing address, home and cell phones numbers, email addresses (so you can receive the Evites and other emails from the Club) and other pertinent information you wish to share with the Club. Next year’s events are being worked and hopefully you will be excited about some of the cruises/events we are planning. You can plan on a Spring Cruise to somewhere new and perhaps an extended Fall Cruise where we will once again plan an exciting Allante’ / XLR drive to test your skills, your stamina and your nerves. We are also looking at the events the Peach State CLC region is planning that we can enjoy as well. Life is good, and you should plan to drive your Allante’ or your XLR as much as you can. Mileage doesn’t hurt either car as long as you maintain and service your prized cars as required. Questions can be directed to Bill Corn, our Technical Director. Hope to see you in Nashville, at the Tech Session, our Thanksgiving and Christmas events and don’t forget our Annual Winter Dinner in January.